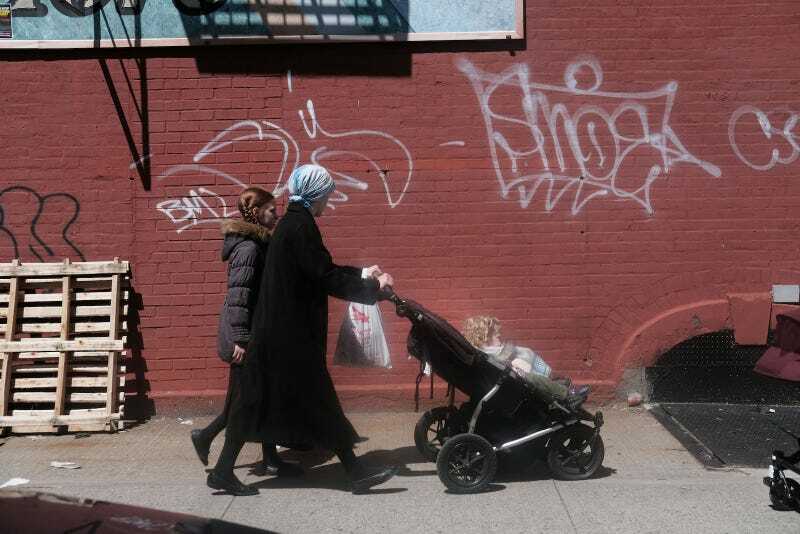 APRIL 10: People walk through an ultra-Orthodox Jewish community in Williamsburg on April 10, 2019 in New York City. As a measles epidemic continues to spread, New York City Mayor Bill de Blasio recently announced a state of emergency and mandated residents of the ultra-Orthodox Jewish community in Williamsburg at the center of the outbreak to get vaccinated for the viral disease. Those who choose not to will risk a $1,000 fine. A group of anonymous parents in Williamsburg, Brooklyn has filed a lawsuit in New York State Supreme Court over an emergency order by Mayor Bill de Blasio mandating that unvaccinated individuals to get their shots. The lawsuit claims the parents all have a religious objection to vaccines; it also cites notorious and incorrect anti-vaxxer claims that the MMR vaccine is specifically dangerous. One of the listed attorneys for the parents is Robert F. Kennedy Jr., an environmental activist better known these days for making strident anti-vaccine claims. The parents are specifically suing the New York City Department of Health and Mental Hygiene and Dr. Oxiris Barbot, the city’s health commissioner. Their lead counsel is Robert J. Krakow, a personal injury attorney in New York City who’s spoken at conferences critical of vaccines and has made representing vaccine-injured patients a cornerstone of his practice. In the petition, four parents, identified only by their initials, say there is “insufficient evidence of a measles epidemic or dangerous outbreak to justify the respondents’ extraordinary measures, including forced vaccination.” New York City has had about 285 measles cases since the outbreak began in October. Measles is highly contagious and particularly dangerous for babies under six months old and people with compromised immune systems; doctors in New York are having to take extraordinary measures to keep the outbreak from continuing to spread. While most of the affected area is populated by Orthodox Jews, not every parent in the lawsuit appears to be Orthodox. The petition also very specifically makes the claim, promoted by many anti-vaccine groups, that the MMR vaccine is particularly untrustworthy. The false claim that the MMR vaccine carries special risks was first promoted by Andrew Wakefield, a British gastroenterologist who subsequently lost his license and whose paper on the subject was retracted. Robert F. Kennedy Jr. has repeated that claim for years, and has headed several organizations critical of vaccines, including most recently the Children’s Health Defense Fund, which said last week it would support a legal challenge against New York city’s vaccination order.